Last week, when spring was supposed to arrive, but didn’t, I made this recipe. It would be perfect eaten with a cold margarita in hand in the fading light of a warm spring day. Instead, I enjoyed the brightly colored slaw atop smoky grilled mahi-mahi inside my home where the thermostat remains set on heat. No matter. It’s a dish I’ll make again. This dish is a fine illustration of the point that delicious food isn’t complicated food. Good ingredients, combined with the proper seasoning, make this Mexican-inspired slaw refreshing and the perfect accompaniment to the mahi-mahi’s earthy rub that brings just the right amount of spicy kick. Store-bought flour tortillas will bring dinner together that much more quickly, although I urge you to make your own. 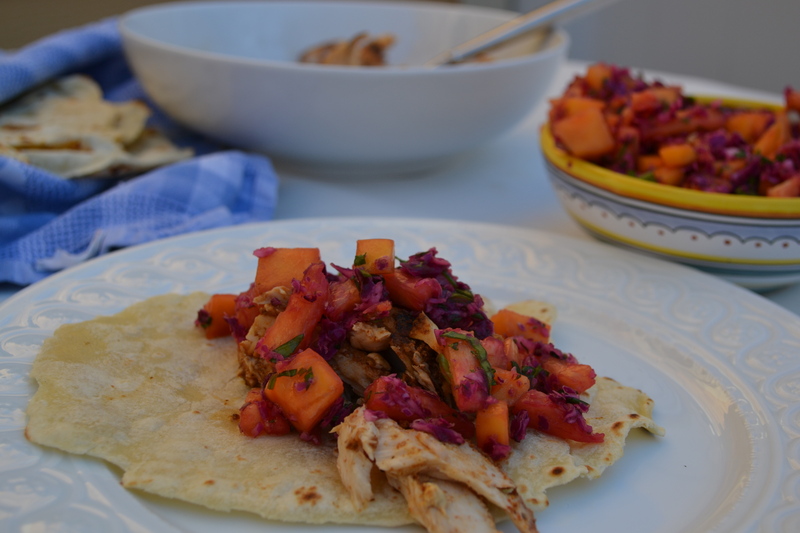 Far from complicated and assembled from ingredients you are sure to have on hand, flour tortillas take this meal from satisfying weeknight dinner to something that demands a little more celebration. The Mexican-inspired slaw comes together quickly. If you don’t want the red cabbage to bleed over the mango and pineapple, keep everything separate until the last-minute. 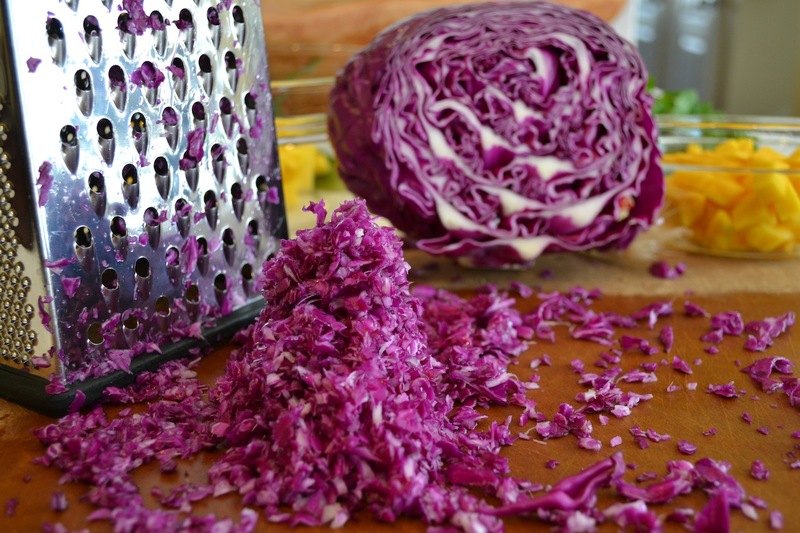 The rosy-hue doesn’t bother me a bit, however, and I prefer to combine all the slaw ingredients a couple of hours before serving to allow the flavors to meld. Mango and pineapple can cause a little head-scratching when it comes to breaking them down. For that reason, I’ve included a step-by-step tutorial as well as a few written tips for how to break down both fruits below. When selecting a mango, don’t worry about the color as it doesn’t indicate ripeness. Green mangos can be just as ripe as red mangos and vice-versa. Aroma won’t help either as they don’t omit much of a smell. The biggest way to tell if a mango is ripe is by touch. A ripe mango will be firm, but with just a hint of give when you gently press your thumb into it. Look for mangos that are free of blemishes and soft spots. To break down a mango, remember that the large seed runs through the center of the fruit. You need to cut on either side of it to remove the two largest chunks of fruit and then use a paring knife to cut the remaining flesh off the seed itself. You can get all the fruit off the seed with some skillful knife-work although I always like to leave a bit behind as it makes a good treat for the cook to gnaw on when no one is looking. For the two large side pieces, cut a cross-hatch pattern and then turn the fruit inside out. From there, it’s simply a matter of using a sharp paring knife to cut the cubes off the peel. When selecting a pineapple, take a whiff. It should smell sweet (especially at its base) and should be firm to to the touch without soft spots. For pineapple (or other large round fruits such as melon or cantaloupe), the first step is to create a flat surface by cutting off the bottom of the fruit. From there, cut off the crown and then use a sharp chef knife to slice off a large slice, going from top to bottom, of the skin. Once you make the first cut, simply follow the lines of the outer skin to cut off the remaining skin. 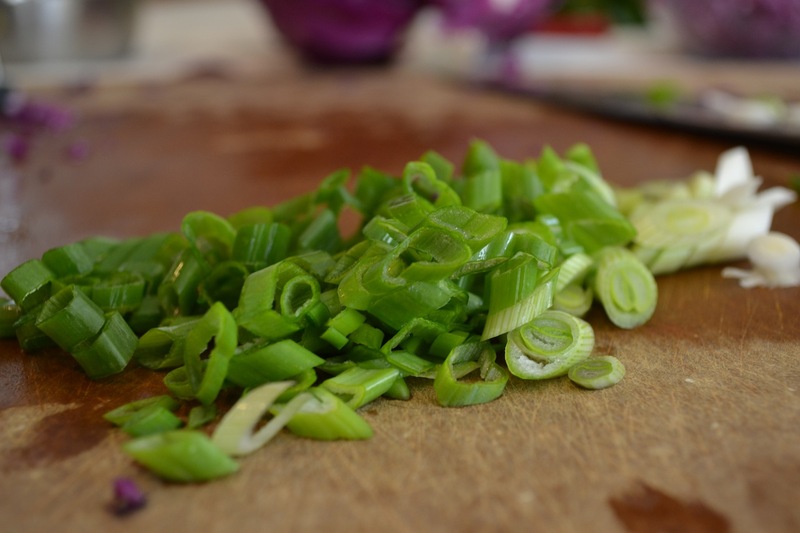 Once all the outer skin has been cut off, use a sharp paring knife to cut out any “eyes” that remain. From this point, it’s just a matter of cutting the remaining flesh from the hard, inner core. But don’t throw the core out! Like the mango seed, I have no problems munching on the tough inner core and always save a few pieces for myself. For those tackling the homemade flour tortillas, fear not. I’ve included specific directions in the recipe that follows, but for best results be sure to roll the tortillas to less than 1/4-inch thickness before throwing them on a hot skillet. While it helps to have one person roll the tortillas while another one cooks them, these can be done with just one set of hands although the process will take a few minutes longer. The end result will still be worth it. Happy grilling! Heat a grill or grill pan over medium-high heat. In a small bowl, whisk together the chili powder, garlic powder, cumin, and salt. 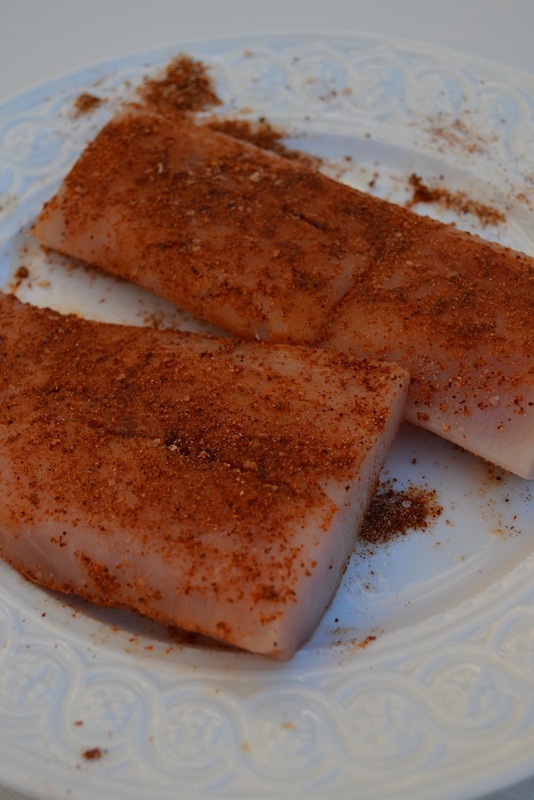 Pat the fillets dry with paper towels and rub the spice mixture all over the fillets. Cover with plastic wrap and refrigerate the fish for 20 minutes. 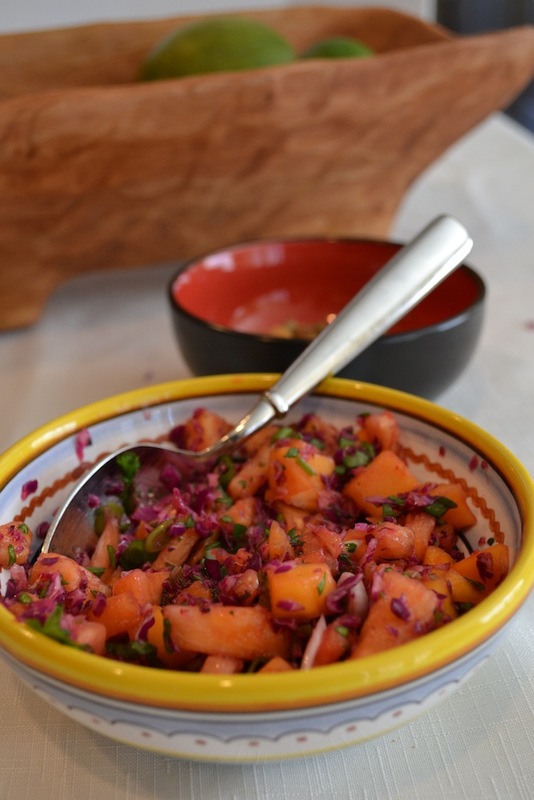 To make the slaw, combine the cabbage, mango, pineapple, green onions, and cilantro in a medium bowl. 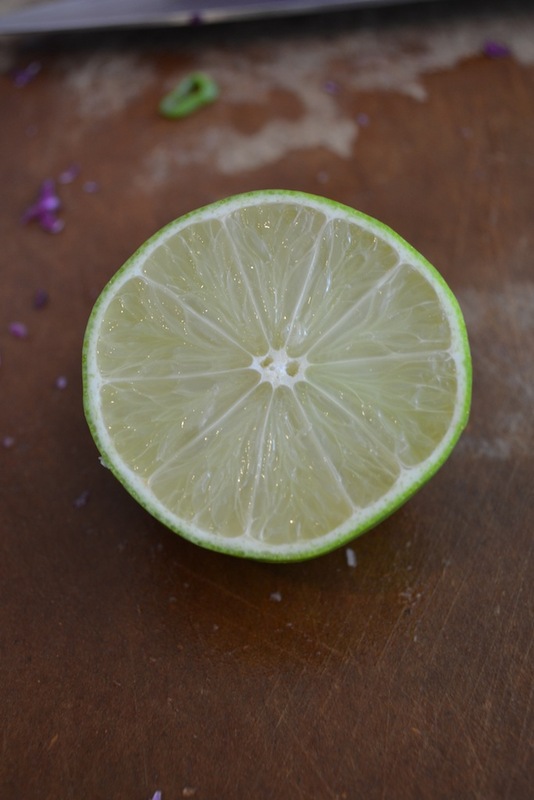 In a small bowl, whisk together the lime juice, olive oil, and agave syrup. 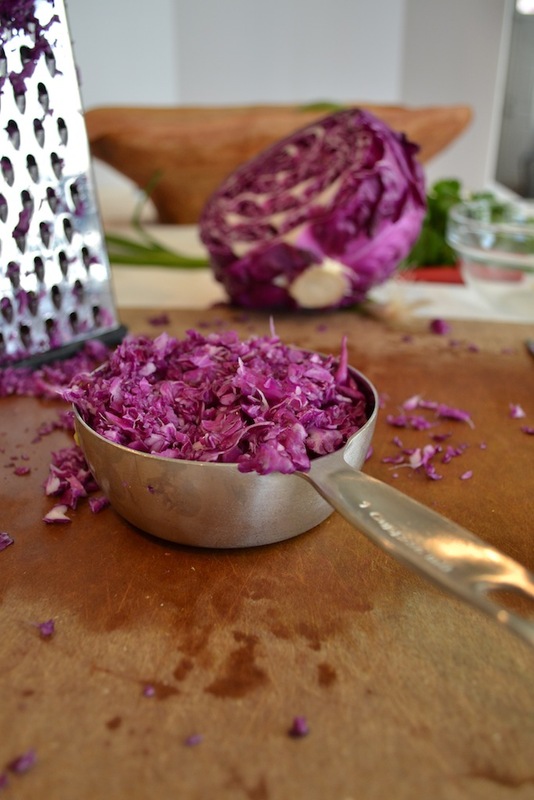 Pour the dressing over the slaw and toss to coat. Season to taste with salt and pepper and adjust the other seasonings as needed. Refrigerate until ready to serve. Reduce the grill temperature to medium and brush the grates with the oil. Add the fish, presentation side down, and cook for about 4 minutes per side until the fish is cooked through and flakes easily. Use a fork to flake the fish into chunks. 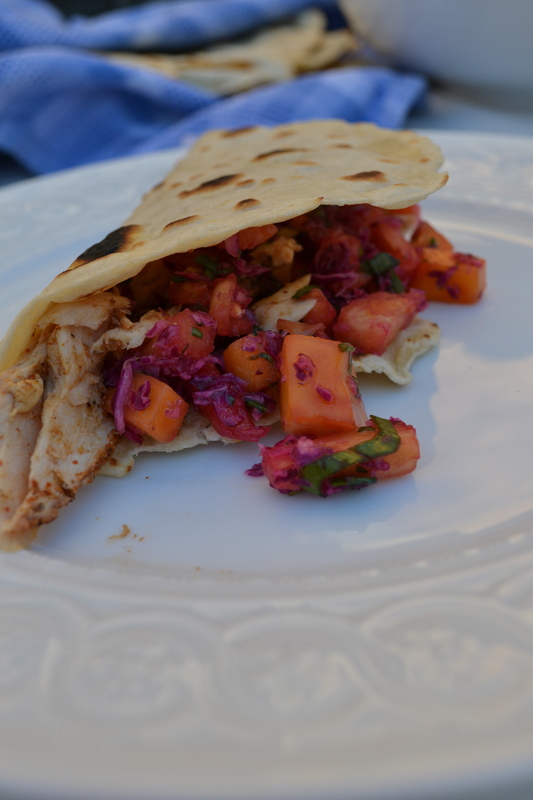 Serve immediately with the flour tortillas and Mexican slaw. Whisk together the flour and salt. Use a pastry blender to cut the lard into the flour mixture until it is in very small pieces. Add the water and stir with a rubber spatula until the water has been absorbed and the dough is crumbly. Turn the dough out on the counter and knead it with your hands until all the flour has been incorporated and the dough is smooth and elastic to the touch. Portion the dough into 12 golf ball-sized rounds. Set the dough balls on a baking sheet and cover with a towel for 30 minutes. Heat a medium skillet over medium heat until very hot. Working with one dough ball at a time, roll the dough ball out to an 8-inch wide circle that is less than ¼-inch thick. Transfer the dough to the hot skillet. Cook each side for about 15 seconds; the tortilla will have brown spots. Don’t overcook the tortillas as they will become crispy instead of soft and pliable. Use tongs to transfer the tortillas to a wire rack. Cover the tortillas with a towel to keep warm. Now this is something that Uncle Jim and I will make this week. Hopefully ours will look as good as your photos! Thanks, Bob! I’m sure it will taste and look fabulous! I loved the very detailed step-by-step photos! 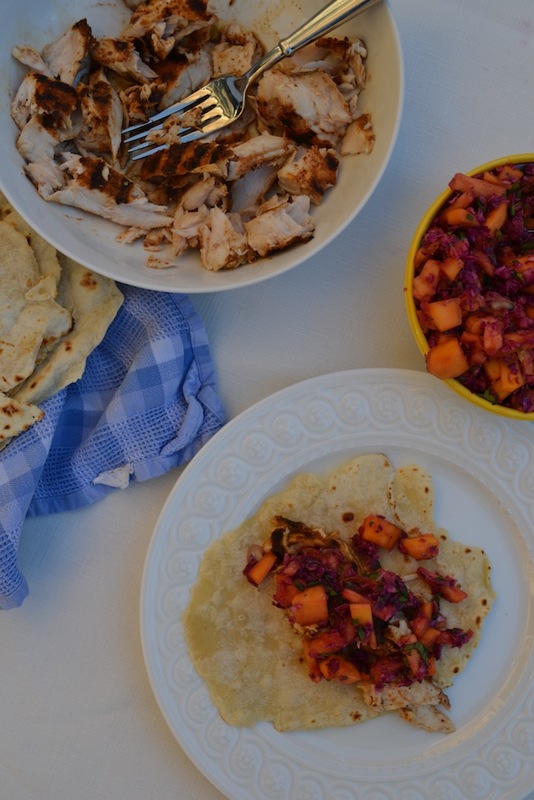 thanks for showing us how to make homemade tortilla wraps! I learn new things everyday! I am craving some. Love mangoes with anything. Thanks, Felicia! I love Buenos Aires and spent a semester there during college. What a wonderfully delicious (and beautiful) place to be. Thanks for reading!